vii, 54 p. : ill. ; 28 cm. Derek Byerlee in collaboration with the Indian Council of Agricultural Research. Derek Byerlee is an economist with the International Maize and Wheat Improvement Center (CIMMYT), Mexico. This publication was prepared as a background paper for the 1990-91 CIMMYT World Wheat Facts and Trends: Wheat and Barley Production in Rain fed Marginal Environments of the Developing World (1991). The views expressed in this paper do not necessarily reflect policies of CIMMYT or ICAR. CIMMYT is an internationally funded, nonprofit scientific research and training organization. Headquartered in Mexico, the Center is engaged in a research program for maize, wheat, and triticale, with emphasis on improving the productivity of agricultural resources in developing countries. It is one of 17 nonprofit international agricultural research and training centers supported by the Consultative Group on International Agricultural Research (CGIAR), which is sponsored by the Food and Agriculture Organization (FAO) of the United Nations, the International Bank for Reconstruction and Development (World Bank), and the United Nations Development Programme (UNDP). The CGIAR consists of some 40 donor countries, international and regional organizations, and private foundations. CIMMYT receives core support through the CGIAR from a number of sources, including the international aid agencies of Australia, Austria, Belgium, Brazil, Canada, China, Denmark, Finland, France, India, Germany, Italy, Japan, Mexico, the Netherlands, Norway, the Philippines, Spain, Switzerland, the United Kingdom, and the USA, and from the European Economic Commission, Ford Foundation, Inter-American Development Bank, OPEC Fund for International Development, UNDP, and World Bank. CIMMYT also receives non-CGIAR extracore support from the International Development Research Centre (DRC) of Canada, the Rockefeller Foundation, and many of the core donors listed above. Responsibility for this publication rests solely with CIMMYT. Correct citation: Byerlee, D. 1992. 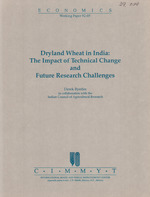 Dryland Wheat in India: The Impact of Technical Change and Future Research Challenges. CIMMYT Economics Working Paper 92-05. Produced in collaboration with the Indian Council of Agricultural Research. Mexico, D.F. : CIMMYT. Abstract: This study focuses on the dryland wheat areas of central and southern India (over half of India's total rainfed wheat area), where wheat is produced on deep vertisols in a fallowwheat system depending heavily on the conservation of monsoon rainfall. Although wheat yields have increased more slowly in dryland areas than irrigated areas, perhaps half of the dryland wheat area is planted to improved varieties (mostly tall, many of them durum wheats) possessing superior drought tolerance, rust resistance, and high quality grain which fetches a price premium. Fertilizer use remains low. Research resources appear to have been allocated to dryland wheat in accordance with its relative importance in total production, but the declining importance of dryland wheat may suggest that less priority be given to wheat research in this environment in the future. However, the close association between the incidence of poverty and dependence on dryland agriculture may justify further research in dryland areas. Consideration should also be given to interactions between favored (irrigated) and marginal (dryland) areas occurring through food and labor markets. Finally, although progress in breeding research may be slow because of the difficulty of the target environment, progress in crop and resource management research may be more rapid. Developing better moisture conservation practices is clearly a research priority, given the limited groundwater supplies for irrigation. (stored moisture) in four rainfed sites, India. Research Station, Powerkheda, Madhya Pradesh. Dr. V.S. Tomar, Head, Regional Research Station, Sagar, Madhya Pradesh. Numerous other individuals at these research centers also provided valuable information and assistance. Several colleagues at CIMMYT contributed to the development of this paper as well. I would especially like to thank Daphne Taylor for research assistance in analyzing agroclimatic and production statistics. I also appreciate the help of Mark Bell for valuable discussions on soils and moisture conservation in dryland wheat, as well as for generating the computer simulations for Sagar. The assistance of Hector Tovar and Laura Saad in drawing the maps and diagrams, Maria Luisa Rodriguez for patiently typing the report, and Jos6 Luis Delgado in doing the layout is gratefully acknowledged. Finally, careful reviews of the paper by Gunvant Desai, Tony Fischer, John Foster, R.R. Hanchinal, and Miguel L6pez-Pereira were most helpful in completing this report. Any remaining errors are of course the author's. This paper is part of a larger effort by CIMMYT in collaboration with NARSs to 1) define the extent of marginal maize and wheat areas with greater precision, 2) characterize the agroecological and socioeconomic conditions under which maize and wheat are grown in these areas, and 3) identify research opportunities for these areas. The paper focuses on the dryland wheat areas of central and southern India in the states of Madhya Pradesh, Gujarat, Maharashtra, and Karnataka (see Map 1), which by almost any standards must be classified as marginal.1 Average farm-level wheat yields are only about 0.7 t/ha, and even on research stations yields average less than 2 t/ ha against a yield potential (under irrigation) of over 5 t/ha. Furthermore, India, along with Turkey, Iran, and China, has the largest concentration of dryland wheat area in the developing world. Finally, dryland wheat in India is largely produced using residual soil moisture; thus these dryland wheat areas represent a unique drought environment within CIMMYT's general definition of mega-environments (Fischer and Varughese 1990). 40% of potential yields defined by available solar radiation and temperature (CIMMYT 1989a). more favorable. Hence this paper uses the terms "rainfed" or "unirrigated" to refer to all rainfed areas in India, whereas the term "dryland" refers specifically to wheat production in Central and Southern India (i.e., a subset of rainfed wheat areas). Map 1. States of India and key rainfed wheat production sites. dryland areas over the past three decades? in productivity in the future? This report draws on three major sources of information. The first source consists of official statistics on rainfed and irrigated wheat area and yields by state, published by the Directorate of Economics and Statistics, Ministry of Agriculture, New Delhi. These official statistics were supplemented by districtlevel statistics on rainfed wheat area, yields, wage rates, and other parameters, assembled by the International Crops Research Institute for the Semi-Arid Tropics (ICRISAT) and others, for eight states in India.2 Second, with the collaboration of the Indian Council of Agricultural Research (ICAR), the major research stations in the dryland wheat belt of central and southern India were visited to observe wheat research and production firsthand and to collate the extensive research that has been conducted by Indian wheat scientists at these stations (see Acknowledgements). Finally, published research reports and articles on dryland wheat in India were extensively reviewed. Together, these various sources of information provide a reasonably complete picture of the current status and future prospects for dryland wheat in India. This section draws on official wheat production statistics to examine overall trends in all rained wheat in India. Although complete statistics for total wheat area and production were available for 1961 through 1990, production statistics disaggregated by irrigation status were incomplete. Hence the period of analysis varies depending on the data available, presenting some difficulties in making comparisons across tables. Maharashtra, Punjab, Gujarat, Rajasthan, and Uttar Pradesh. much faster than the area sown to any other food grain. 3 Wheat area expanded most rapidly in the northeastern states of Assam, Bihar, Orissa, and West Bengal, which currently make up 10% of India's total wheat area (Table 1)." The states in the traditional wheat belt of northwestern India (Uttar Pradesh, Punjab, and Haryana) also recorded above average growth in wheat area. The slowest expansion occurred in central and southern India (the region that is the subject of this paper), where wheat area increased at about only 1.0% annually. Note: All trends are significant at the 1%c percent level except where noted as not significant (ns). maize, 0.84%; wheat, 2.52%o; and sorghum, -0.61 %. maturing varieties, which allowed wheat to be grown after the main crop, rice. just 25% in 1986. The common statement that crop area is expanding into marginal areas is certainly not valid for wheat in India, where favored (irrigated) areas have steadily become more important relative to marginal areas in the wheat economy. Four states dominate rainfed wheat production: Madhya Pradesh, Uttar Pradesh, Maharashtra, and Karnataka. The largest area of rainfed wheat is in Madhya Pradesh (2.2 million hectares), which accounted for 42% of the rainfed wheat area in 1986-88 (Figure 2). The next largest concentration of rainfed wheat area is in Uttar Pradesh (21% of the rainfed wheat area), followed by Karnataka and Maharashtra in southern India (together these states account for 10% of the total rainfed wheat area). In 6 of the 13 wheat growing states, more than half of the total wheat area was rainfed in 1986-88 (Figure 3). The distribution of rainfed and irrigated wheat based on district-level data clearly indicates the concentration of rainfed wheat in northern Madhya Pradesh, where Sagar and Vidisha Districts each report sowing over 200,000 ha of wheat, virtually all of it under dryland conditions (Map 2). Districts adjoining Madhya Pradesh to the north, such as Kota and Tonk in Rajasthan and Hamirpur and Banda in Uttar Pradesh, are also important producers of rainfed wheat. Figure 1. Trends in rainfed and irrigated wheat area in India,1951-88. by two to three years, and hence the series used here extends only to 1988. Rainfed wheat cultivation extends south and west from northern Madhya Pradesh but is much less dominant in the cropping systems. Throughout central and southern India, rainfed wheat is grown on deep black vertisols (see the section on "Soils," later in this paper, and Map 3). Rainfed wheat in northern India is grown on alluvial soils but rainfall is generally much higher and temperatures are cooler. Figure 2. Rainfed wheat area by state, India, 1986-88. Rainfed wheat area as a percentage of total wheat area Figure 3. Rainfed wheat area as a percentage of total wheat area within states, India, 1986-88. Approximately 2.7 million hectares of rainfed wheat are subject to dryland conditions in central and southern India (including neighboring districts of Uttar Pradesh and Rajasthan). About the same area is sown to wheat in rainfed areas of the northwestern and northeastern states, but moisture conditions are more favorable. Several districts in northeastern Uttar Pradesh produce over 75,000 ha of rainfed wheat under these more favorable conditions. Although rainfed wheat area still accounts for nearly one-quarter of India's total wheat growing area, much rainfed area has been converted into irrigated area. Rainfed area has decreased in all states except Assam.6 Irrigated area has expanded most rapidly in central and southern India and in the state of Bihar (Table 2). In Madhya Pradesh (the major producer of dryland wheat), only 6% of the wheat area was irrigated in 1960 compared to over 40% in 1990. Map 2. Approximate distribution of irrigated and rainfed wheat in India. area of all crops grown in a year). Note: *, **, *** denote significance at the 10%, 5%, and 1 levels, respectively; na = not available; ns = not significant. rainfed area (-0.56%), and wheat's share of the remaining rainfed cropped area became smaller (-1.52%). Wheat accounts for only 5% of the rainfed cropped area (Figure 4). Increasingly, rainfed wheat area is concentrated in central and southern India, where wheat is a less important crop. Cropping intensity in both rainfed and irrigated areas has steadily increased (at 0.39% per year in rainfed areas and 0.51% per year in irrigated areas) (Figure 5). However, increased cropping intensity is not an important component of the expansion in wheat area, compared to the growth in irrigated area and the greater importance of wheat in irrigated cropping patterns. Note: All trends are significant at the 1% level. a Gross cropped area is the sum of area of all crops grown in a given year. Figure 4. Wheat area as percentage of gross cropped area, India, 1961-88. The coefficient b2 tests for significant differences in growth in irrigated wheat area between 1976 and 1988 (defined here as the post-Green Revolution period) compared to the period from 1965 to 1976 (the Green Revolution period). The coefficient is negative if growth has slowed. Figure 5. Cropping intensity and trends for districts grouped by percentage wheat area that is rainfed, India. wheat area for 1976-88 appears to have slowed sharply to less than half the rate for 1965-76. Among the components of increased wheat area, cropping intensity is the only one whose growth did not decline in 1976-88. Given these trends, and the fact that much wheat area is already irrigated and construction of new irrigation facilities has slowed, irrigated wheat area in India is likely to grow much more slowly in the future than in the past. This means that, in rainfed as well as irrigated areas, higher yields will be the main source of production increases. Although data exist on yields of rainfed and irrigated wheat by state (Government of India, various issues), the data are incomplete. In some cases there are significant differences between the official average yield statistic for the state and the derived yield (i.e., weighted average yield based on rainfed and irrigated area and yields).7 For all India, however, there is a very high correlation (r=.98) between the derived yields and the official statistics. Note: *, **, *** indicate that the trend growth rate in the second period is significantly different to that in the first period at the 10%, 5%, and 1% levels, respectively; na = not available. gathered, so the latest data available for many states are from 1985 or 1986. Figure 6 illustrates yield trends in irrigated and rainfed areas in India from 1968 to 1985, the last year for which data are complete for all the major wheat producing states. For all of India, the estimated trend yield in 1985 was 2.2 t/ha in irrigated areas compared to 0.9 t/ ha in rainfed areas. From 1972 to 1985, wheat yields grew at an annual rate of 2.8% in irrigated areas compared to 1.4% in rainfed areas (Table 5). Over the same period, the growth in wheat yields for the entire country 3.1% was higher than growth in yields of either irrigated or rainfed wheat, because of the increasing share of wheat area under irrigation. Figure 6. Trends in yields of irrigated and rainfed wheat in India and annual growth rates (g), 1968-86.
less, except where denoted by "ns" (not significant); na = not available. Figure 7. Average yields of rainfed and irrigated wheat in 10 states, India, 1981-85. Figure 8. Yields of rainfed and irrigated wheat, Madhya Pradesh and Punjab, India, 1969-88.
yielding areas of central and southern India, which depresses the overall average growth rate. well as relative changes in rainfed wheat yields in the Punjab are remarkably similar to those for yields of irrigated wheat in Madhya Pradesh (Figure 8), a dry environment where the water supply for most irrigated wheat is fairly limited. An unexpected finding is that variability in rainfed wheat yields is quite low (coefficient of variation around trend of 6.8% for all India) and is in fact less than yield variability in irrigated areas (coefficient of variation around trend of 8.1% for all India). This difference in yield variability occurs in part because a high share of rainfed wheat is grown under residual moisture; if farmers see that moisture conditions are inadequate, they reduce their wheat area. Hence rainfed area is often more variable than yields (see the section on "Rainfall," below). In central and southern India, limited supplies of irrigation water increase yield variability in socalled irrigated areas. The Declining Importance of Rainfed Wheat Production Reductions in the area sown to wheat under rainfed conditions, and the fact that yields in irrigated areas have grown twice as fast as yields in rainfed areas, imply that the share of rainfed wheat production has fallen drastically. Rainfed areas accounted for 23% of the wheat area in 1988 but produced only about 11% of the wheat crop. This is a sharp decline from 46% of the wheat area and 27% of production in 1970, and an estimated 67% of the area and 50% of production in 1960 (Figure 9). These trends are significant because the allocation of research resources to rainfed wheat must adjust to the relative importance of rainfed wheat in the overall wheat economy (see "Research Resource Allocation to Dryland Wheat," below). Figure 9. Share of rainfed wheat in total wheat area and production, India. Three sets of agroclimatic variables soils, rainfall, and temperature interact to influence the distribution and productivity of rainfed wheat in India. Rainfall distribution and soil type determine the extent to which rainfed wheat production depends on residual moisture. Deep black vertisols and good monsoon rainfall enable wheat to survive almost exclusively on residual moisture from the monsoon. In areas with lighter soils, some rainfall during the growing season is required to obtain even a minimum wheat yield. Where wheat depends on residual moisture, there are clear advantages in planting early to best exploit the end of the monsoon rains. However, high temperatures in September and October limit the extent that the planting date can be moved forward. To clarify these interactions, the following sections summarize key agroclimatic factors, with emphasis on the implications for dryland wheat in central and southern India. The dryland wheat belt of central and southern India extends through the zone of black vertisols or cotton soils, which covers 546,000 km2 (Map 3). The depth of these soils varies by as much as 2 m; their depth, together with their high clay content of 40-60%, gives them a high moisture holding capacity. These soils are generally low in organic matter and on sloping land are subject to serious erosion and degradation (Put and van Dijk 1989). The black vertisols have two key properties relevant to crop production. First, because of their high clay content, they are exceedingly sticky when wet and on drying develop large, deep cracks. When very dry or very wet, these soils are difficult or impossible to till, and at the onset of the monsoon there is a very short "window of opportunity" when moisture conditions permit land preparation and planting (Virmani, Rao, and Srivastava 1985). Second, the vertisols can retain a great deal of moisture. In the deep vertisols in the higher rainfall areas of northern Madhya Pradesh, 400 mm of moisture or more may be stored in the soil profile at the end of the monsoon, at least half of it available for winter crops such as wheat. However, since vertisols are impermeable when their water content is high, they are subject to waterlogging in high rainfall areas. This adds to the difficulty of managing kharif (summer) crops and favors a fallow-wheat rotation. To the north, in the alluvial soils of the Gangetic Plain and the Terai (lowlands), rainfed wheat must depend less on stored moisture and requires significant growing season rainfall. To the south, in Maharashtra and Karnataka, high winter temperatures favor sorghum as the winter cereal crop in rainfed areas. moisture is determined by many factors, including rainfall, evaporation, previous crop or fallow, and soil type. An analysis of those factors is not attempted here; rather cumulative probabilities of rainfall in September and October are plotted for three key sites where dryland wheat is grown (Sagar in Madhya Pradesh, Arnej in Gujarat, and Annigeri in Karnataka) and compared to a rainfed site in northeastern India (Patna) (Figure 10). At Sagar, in the largest dryland wheat growing district in India, it is clear that rainfall is highly variable prior to sowing, even though average annual rainfall is 1,237 mm, over 90% of which falls in the monsoon. Even at Sagar there is just slightly more than a 50% probability of receiving 200 mm of rainfall in the pre-sowing period. South and west of Sagar, monsoon rainfall decreases and becomes more unreliable. At Arnej in Gujarat, the chance of receiving 200 mm of rainfall in SeptemberOctober is only 20%. In contrast, at Patna in the northeast there is a 66% chance of receiving 200 mm of rainfall prior to sowing. Map 3. Area of black soils in relation to rainfed wheat area, India. Growing season rainfall is even more erratic but shows similar patterns (Figure 11). At Sagar there is less than a 20% chance of receiving 100 mm or more of rainfall during the crop cycle and a 50% chance of receiving 50 mm or less. In Gujarat, there is practically no chance of receiving any significant rainfall in the growing season. At all sites, stored moisture is critical for the survival of the wheat crop. Figure 12 shows mean monthly rainfall in relation to potential evapotranspiration at Sagar. Wheat is planted just at the time that precipitation falls below evapotranspiration, so that during the entire growing season, evapotranspiration usually exceeds the amount of rainfall. These different rainfall patterns influence cropping patterns. In Annigeri (a wetter site), double cropping is common in most years. At Sagar the preferred rotation is fallow-wheat, because of the problems of managing the heavy black soils in the monsoon season and because the moisture for double cropping is usually insufficient. In Gujarat, in many years there is not enough moisture for even a single crop. In addition, the relationship between 1) the amount of rainfall and 2) rainfed area and yield is quite different at a dry site, such as the district of Ahmedabad in Gujarat, and a wetter one, such as the district of Sagar in Madhya Pradesh (Figures 13 and 14). The monsoon is so uncertain in Gujarat that farmers first decide whether to plant wheat or leave the land fallow, depending on how much moisture is available at planting time. Between 1978 and 1988, there was almost a linear relationship between area sown to wheat and the amount of monsoon rainfall (Figure 13). The exception is the very wet year of 1981, when 1,000 mm were recorded. After the unusually dry monsoon of 1987, practically no wheat was sown. Over the same period, rainfed yields also tended to be quite variable (Figure 13). Figure 12. Mean monthly rainfall and evapotranspiration, Sagar, Madhya Pradesh, India. Monsoon rainfall (mm) Figure 13. Relationship between rainfall and rainfed wheat area and yields, Ahmedabad District, Gujarat, India, 1978-88.
in deviations from the long-term linear trend. wheat area is only 8%, compared to 51% in Ahmedabad District. Although yields are significantly and positively correlated with total rainfall from September to February (r = 0.66), yields are also quite stable with a CV of 15.5%. 10 A A A ................... . Figure 14. Relationship between rainfall and rainfed wheat area and yields, Sagar District, Madhya Pradesh, India, 1955-86.
for January exceed 17.5'C). In the extreme north of the dryland wheat belt (in northern Madhya Pradesh), winter temperatures average a little below 17.5'C and there is some risk of frost; this favors the cultivation of wheat rather than sorghum. To the south, temperatures increase to a mean January temperature of 23-24")C in Karnataka (Figure 15), which along with Sudan is the warmest area in the world where wheat is grown commercially. The most critical relationship between factors influencing dryland wheat production in central and southern India is depicted in Figure 16. At the end of the monsoon in September, a high level of moisture is stored in the soil (up to 357o), and wheat planted early has the potential to use this moisture. However, soil temperature is also high and can impede germination and seedling emergence. Over time, both the soil moisture level and temperature decline. At later planting dates, germination/ emergence rates may increase because of lower soil temperatures (although this may be counteracted by inadequate moisture). However, the low probability of growing season rainfall means that late planted wheat is likely to develop in a soil moisture profile that falls steadily from an average of 25% at planting to 13% in February. Because the dryland wheat crop is nearly always forced to maturity by moisture stress in late February, it avoids extreme heat stress at flowering and grain filling (except in the south, where the entire growing season is relatively hot) and the more critical period of heat stress occurs at the seedling stage. Figure 15. Average temperatures during the wheat growing season at four sites, India. Simulation of Wheat Yields, Sagar District The EPIC model (Williams et al. 1990, Sharpley and Williams 1990) was used to simulate crop growth and yields over 50 years based on soil and climatic conditions at Sagar, Madhya Pradesh (M. Bell, pers. com.). The simulation confirms most of the findings reported above. With only moisture as the limiting factor (i.e., soil fertility, diseases, and other factors are held at non-limiting levels), average yields were 2.2 t/ha with a CV of 25%. In other words, yield variability is considerably lower than in other marginal rainfed areas (Belaid and Morris 1990), reflecting the extreme importance of residual moisture relative to growing season rainfall at Sagar. Simulated yields ranged from an absolute minimum of 1.2 t/ha to a maximum of 3.4 t/ ha (Figure 17). Figure 16. Effect of soil temperature and moisture on wheat germination, Indore, India, 1986-87 (mean of 10 varieties). 11 The variability in yields under irrigation is caused by temperature fluctuations. growing season rainfall can be important, as shown by the high correlation between CAW and growing season rainfall. The low correlation between CAW and September-October rainfall is probably due to variation in soil moisture conditions at the beginning of this period as well as the loss of much monsoon rainfall through runoff. Figure 17. Simulated wheat yields at Sagar, India. Note: Yields simulated using EPIC model (Williams et al. 1990, Sharpley and Williams 1990). Note: *, **, ***, indicate significance at the 10%, 5%, and 1% levels, respectively. a Based on 50-year simulation. b Cumulative available moisture. In northern India where rainfall is higher, the farming systems in which rainfed wheat is grown are similar to adjacent irrigated farming systems. In the northeast, wheat may be grown on residual moisture after rice; in the northwestern foothills, wheat is often grown after maize or kharif pulses. However, in the drier areas of central and southern India, dryland farming systems are quite distinct from those in the adjacent irrigated areas. In general, dryland wheat in central and southern India is grown after fallow (to conserve moisture) and single cropping is the norm. The rest of this section briefly describes the main characteristics of these dryland systems. change very quickly at the Source: Singh, Jain, and Rao (1984). ch ng of the monsoon from a Includes chickpeas intercropped with linseed. beginning ob Includes lentils intercropped with linseed. too dry to too wet. c Includes various intercrop combinations.
" The risk of waterlogging and flooding during the monsoon. * The difficulty of controlling weeds in the kharif season. Given that most of the rain falls during the kharif season, the system is relatively inefficient in using available moisture; only about one-quarter of the annual rainfall may be used for crop evapotranspiration in the rabi season. The main rotation is kharif fallow-rabi wheat. Pulses, chickpeas, and lentils are also important in the rabi cycle. In areas where soils are shallow and less fertile, pulses tend to dominate. In medium-depth better drained soils, soybeans have been found to be suitable for cultivation in the kharif season and have spread quite rapidly in some areas in recent years. In the district of Sagar, for example, rainfed soybean area grew from practically zero to over 70,000 ha in the late 1980s. Where soybeans are produced in the kharif season, land is typically left fallow in the rabi season. Pandey (1986) shows that even in this relatively favorable dryland wheat area sufficient moisture is available to plant wheat after soybeans in less than one out of every three years. Much of the expansion in soybean area has occurred on larger farms where the opportunities for substitution between wheat and soybeans are greater. In contrast, farmers who have less land place considerable priority on meeting subsistence needs for grain and straw, so the area on which soybeans substitute for wheat is smaller (Foster et al. 1987). Further south, where temperatures are warmer, rainfall is lower, and there is no risk of frost, the importance of wheat in the rabi cycle declines. Wheat is replaced by rabi sorghum, although where it can be grown wheat continues to be the preferred subsistence crop. Cotton rather than soybeans is the dominant cash crop. Both rabi sorghum (planted in September) and cotton (planted in August) compete directly with wheat. Kharif fallow is commonly practiced because of unreliable monsoon rains and the risk of kharif crop failure. However, double cropping is practiced in the higher rainfall areas of northern Karnataka (usually wheat after mung beans). Throughout the dryland wheat areas, wheat is often intercropped. In Madhya Pradesh the common intercrops are chickpeas, lentils, and linseed (Table 7). In Maharashtra and Karnataka wheat is intercropped in rows of safflower with 5-6 rows of wheat (25-cm spacing) for every row of safflower. These intercrop combinations appear more profitable than sole cropping (Table 8). Intercropping is also likely to reduce risks (Jodha 1981). For example, in on-farm experiments in dryland Karnataka over four years, the wheat-safflower intercrop was more profitable than either safflower alone or wheat alone in three years out of four, although on average safflower alone was most profitable (RR. Hanchinal, pers. com.). Roles of Livestock and Wheat Straw Livestock are also important in the farming systems of the dryland wheat areas, and wheat straw is a valuable byproduct of wheat production. According to cost of production surveys, wheat straw accounts for 26% of the total value of wheat production in Madhya Pradesh (rainfed and irrigated areas), compared to only 12% in the Punjab. In rainfed districts, the value of wheat straw tends to be much higher. The value of straw is 35% of the value of the wheat crop in Madhya Pradesh (at post-harvest prices), and in dryland Karnataka the value of straw almost equals the value of grain.12 In drought years the value of straw may exceed the value of grain. As the use of tractors and irrigation increases in dryland Madhya Pradesh, the value of straw may be decreasing. Nonetheless, on smaller holdings where bullocks continue to be used, producing wheat straw for fodder is an important subsistence objective in wheat production. In assessing the role of wheat in dryland farming systems, it is important to recognize that wheat is a relatively low-cost, secure crop largely produced for home consumption (both of grain and straw). Tables 9 and 10 summarize the costs of cultivation for partially mechanized wheat production in Madhya Pradesh and non-mechanized wheat production in Gujarat. Source: Foster at al. (1987). a Return to land and capital. generally assumed to be 1:2.
about one-third of the labor used in irrigated areas. In Sagar, Madhya Pradesh, a yield of about 300 kg/ha is needed to pay the variable costs of wheat production. The average yield of rainfed wheat in the district is about 900 kg/ha with a low variability (see "Simulation of Wheat Yields, Sagar District," above). In addition, since harvesting costs are over 25% of total costs and are proportional to yields, variability in economic returns from dryland wheat is lower than variability in yields. Farmers in Sagar regard wheat as a secure crop. Small farmers in this area produce wheat largely for home consumption; the modest marketable surplus of wheat generated by larger farmers is intended for specialized markets that pay a premium for quality wheats (see "Prices," below). to cover variable costs 300 kg/ha Source: Farmer interviews. Source: Agricultural Extension Office, Khuria. In the harshest environment for dryland wheat, the Bhal tract of Gujarat, farmers use even lower levels of inputs (Table 10) and can recover variable costs with a yield of only 200 kg/ha. Yields in this area are somewhat more variable, but recall that farmers can adjust their wheat area to the amount of moisture available at sowing (Figure 12). Hence incomes and food supply may vary quite substantially from year to year, but farmers face little risk once they have decided whether to plant wheat or not. Over 50% of India's dryland wheat area is now planted to improved or recommended varieties. Most of these varieties were adopted after 1976, when it was estimated that only 15% of all rainfed wheat area was sown to improved varieties (Desai 1982). Traditionally a large part of the dryland wheat area of central and southern India has been sown to durum wheat, which has dual uses in bread (chapati) or in many specialized foods. Durum wheat still predominates in Gujarat, Maharashtra, and Karnataka, but most of the wheat sown in Madhya Pradesh is now bread wheat (Table 11). Triticum dicoccum is also grown in the south, but mostly under irrigation. A considerable number of wheat varieties have been released for rainfed areas in India over the past three decades, especially for the dryland areas of central and southern India (Table 12). Varieties released for dryland central and southern India tend to be tall compared to varieties for higher rainfall areas elsewhere in India. Nearly all of the latter varieties are semidwarf wheats, many of which are recommended for irrigated areas as well. Some of the varieties released for rainfed areas have been widely adopted, especially C306 (and Sujata, a selection from C306) in Madhya Pradesh; MACS-1967 (durum) in Maharashtra; Bijaga Yellow (durum) in Karnataka; and A-206 and GW-1 (also durum wheats) in Gujarat. Sources: Interviews with wheat breeders in each state. much because the total number of varieties released has rapidly increased in recent years. The declining share of rainfed varieties is, of course, consistent with a decline in the share of wheat produced under rainfed conditions a theme that will be discussed later. The proportion of durum varieties has averaged about 14%, which is well above their share in production. All but two of the durum wheats were released for central and southern India. It is estimated that over half of the rainfed wheat area is now sown to recommended varieties. It is also evident that adoption of improved varieties is closely correlated with the availability of irrigation (Figure 18). In predominantly rainfed areas, improved varieties came to be adopted in the early 1970s, when a large part of the irrigated districts had already been sown to improved varieties. Improved varieties have been adopted in dryland areas because of two main reasons. First, local land races are highly susceptible to leaf and stem rust. When weather favors the buildup of rust inoculum, disease losses are very high (Sheopuria 1990). The release of varieties resistant to rust has been a major factor in stabilizing yields. Second, farmers in dryland areas grow varieties whose high grain quality fetches a premium price (see "Prices," below); to be successful, new varieties must have high quality grain. Source: Jain and Byerlee (forthcoming 1992). a Includes state and central releases. b Includes varieties released for both rainfed and irrigated areas. Figure 18. Percentage of total wheat area under modem varieties in districts grouped by size of rainfed area, India, 1966-83. Source: District data. Source: Upadhvaya et al. (1986). their 30-50% higher germination rate. Nonetheless, because of better disease resistance the improved varieties have been widely adopted. For example, the variety C306, grown on a wide area in Madhya Pradesh, combines reasonable disease resistance with high grain quality and excellent drought tolerance. Experiments have consistently shown the superior performance of C306 when it is grown in residual moisture or with limited irrigation (Sheopuria, pers. corn.). Overall, breeding improved wheat varieties for dryland conditions in central and southern India is a formidable challenge. Varieties require an ability to germinate in hot soils, long coleoptiles to emerge from deep planting, and a deep root system to exploit receding residual moisture as the season progresses (Hanchinal 1988). Grain quality is also a major criterion for farmer adoption, given the high market premiums for quality. Input responsiveness seems to be a secondary criterion, since there is almost never enough moisture to produce more than 2.0-2.5 t/ha. Nonetheless, slow progress has been made; successful (widely adopted) varieties have been released about once every 20 years in each state. As a result, yields are stable in those few years when rusts (leaf rust and, for durum wheat, stem rust) are a problem. Although considerable emphasis has been given to developing varieties for dryland areas, it is generally recognized that improvements in crop and soil management to conserve moisture and to utilize available moisture more efficiently play a major role in increasing productivity for these areas (Bolton 1979, Byerlee and Winkelmann 1981, CIMIMT 1989a). This section reviews the potential for increasing the productivity of wheat in dryland areas of central and southern India through increased fertilizer use, fallowing, moisture conservation, and investment in irrigation. Statistics on fertilizer use in wheat are available only for 1976. Nonetheless, data on rabi fertilizer off take in states where wheat is the major crop, combined with estimates of the proportion of rabi fertilizer used on wheat, can be used to approximate trends in fertilizer use on wheat (see Appendix A). Overall, the average amount of fertilizer used on wheat for all India is around 110 kg nutrient/ ha, compared to only 25 kg nutrient/ ha in 1969 (Figure 19). However, as expected, fertilizer use on wheat at the state level closely reflects the area under dryland wheat. Average fertilizer use on wheat is about 45 kg nutrient/ ha in Madhya Pradesh compared to 200 kg nutrient! ha in the Punjab (Figure 19) and 95 kg nutrient/ ha in Uttar Pradesh. Nonetheless, fertilizer use in Madhya Pradesh was virtually nil in 1969. The increase in fertilizer use in large part reflects the expansion of irrigated area, discussed below. As with the use of improved varieties, use of fertilizer in rainfed and dryland wheat areas expanded rapidly in the past decade. In the 1970s, it was estimated that only 10% of the rainfed wheat area was fertilized, at an average rate of 35 kg nutrient/ha13 (Desai 1982). In contrast, it is estimated that 70% of the irrigated area was fertilized at nearly 80 kg nutrient/ha. Although comparable data are not available for the 1980s, a compilation from various sources indicates that perhaps half of the dryland wheat area in central and southern India is now fertilized. For example, in 1989 it was estimated that 41% of the dryland wheat area in Karnataka and 65% of the dryland wheat area in Gujarat was fertilized.4 In Madhya Pradesh, it is estimated that 65% of the total wheat area was fertilized. Assuming that 90% of the irrigated area was fertilized, this implies that 50% of the dryland wheat area in Madhya Pradesh was also fertilized. However, fertilizer use varies a great deal between districts in Madhya Pradesh. Less than 10% of the wheat area is fertilized in some districts where levels of irrigation are low (Figure 20). Also, fertilizer use in rainfed wheat varies from year to year depending on moisture conditions. Even moderate doses of nitrogen applied early in the season may depress yields in very dry years due to excessive vegetative growth. However, in those few years when rainfall in the growing season is timely, farmers may top-dress to boost yields. 1968 1970 1972 1974 1976 1978 1980 1982 1984 1986 1988 1990 Figure 19. Estimated fertilizer use on wheat in India, 1969-90. Source: See Appendix A.
areas of central and southern India. 14 Monitoring and evaluation reports of the state extension system. The general recommendation is to apply 40-20-0 kg N-P205-K20 / ha, but farmers approximate these doses only in the wheat belt of northern Madhya Pradesh. In Karnataka, farmers who apply fertilizer use only about 20 kg nutrient/ ha (equally divided between N and P205), and in Gujarat the average is closer to 10 kg/ha. These variations in fertilizer use reflect expected fertilizer response. For low doses of fertilizer, the estimated grain-to-nutrient ratio for rainfed wheat in Madhya Pradesh is about 10 kg wheat to 1 kg nutrient (Fertilizer Association of India 1985, Rao 1976). In drier areas, this response is lower. In Maharashtra, the estimated ratio is only 5.5:1 (Kohli 1976) and no response was reported in over six years of fertilizer response trials in Gujarat's dryland wheat areas (Maliwal 1989). Although the area and dosages of fertilized dryland wheat are low, substantial progress has been made over the past decade in increasing fertilizer use. In fact, increased fertilizer consumption may account for much of the increase in dryland wheat yields since 1970. If 50% of rainfed wheat is now fertilized at an average rate of 30 kg nutrient/ha, this could account for an increase in average dryland yields of 150 kg/ha. Under the extreme limitations of moisture in dryland wheat production in central and southern India, only very slow growth in fertilizer use can be expected in the future. Figure 20. Relationship between fertilizer use in the rabi (winter) cycle and irrigation in districts of Madhya Pradesh, India, 1983-84. Fallow Management and Moisture Conservation Clearly the success of dryland wheat production in central and southern India depends on conserving moisture during the monsoon season (see "Rainfall," above). During this season, farmers attempt to maintain a clean fallow through two to four tillage operations using a shallow scraper-harrow, which kills weeds and creates a shallow soil mulch in the top 5 cm of the soil surface that helps conserve moisture. Another widely used technique is to level and bund fields, so that monsoon rainfall can stand in the fields for up to two months. This system, locally called the haveli system, achieves several purposes: 1) it prevents runoff and hence soil erosion; 2) it conserves moisture, since 50% of monsoon rainfall may be lost to runoff (Singh and Raje 1984); and 3) it helps prevent the germination of kharif weeds, especially Karsgrass (Saccharum pontaneum), a serious perennial weed prevalent in the wheat growing areas of Madhya Pradesh. The main disadvantages of the haveli system are: 1) the capital cost to level the field and construct bunds and 2) the need to dedicate a bunded field to rabi cropping and hence the loss in flexibility to substitute between rabi and kharif crops. The practice has, however, become widespread in the main dryland wheat belts of Madhya Pradesh. Finally, the most efficient use of moisture may be to plant kharif crop land that is now commonly left fallow. The International Crops Research Institute for the Semi-Arid Tropics (ICRISAT) has devoted two decades to research on technologies to allow kharif cropping in deep vertisols in higher rainfall areas in a double cropping sequence. This technology depends on broad beds and furrows across the slope to facilitate drainage and moisture conservation. The technology, extensively demonstrated over several years in Madhya Pradesh, has had only partial success (Foster 1987, Walker and Ryan 1990). Farmers tend to adopt elements of the technological package, but the key element, a bullock-drawn wheeled tool-carrier, has not been adopted because of doubled operating costs, high initial investment outlays, farmers' increasing use of tractors, and the uncertainty associated with double cropping. Low adoption is also explained by farmers' strong desire to maintain a considerable proportion of area under wheat to produce both subsistence grain and fodder. Double cropping by planting wheat after soybeans greatly decreases the probability that moisture will be sufficient for planting wheat (hence the risk of crop failures in the rabi season) (Pandey 1986). Improvements in the physical structure of soils may also help conserve moisture. Organic manures, such as farm yard manure (FYM) and green manures, are recognized as helping improve moisture conservation. However, farmers' use of FYM tends to be quite low in the black vertisols and is often confined to cash crops (e.g., cotton). Promising experimental results have been obtained through the rotation of wheat with deep-rooted crops such as castor, which help to improve the physical structure of soils (IARI 1990). The most widely used strategy to deal with the serious problem of drought stress and low yields in dryland wheat is investment in irrigation facilitates to provide limited or full irrigation to the crop. The number of tubewells in central and southern India has increased rapidly over the past two decades, facilitated by village electrification, so that now over 40% of the wheat area is irrigated. In most areas, wheat receives priority in the allocation of scarce irritation water supplies, although the water supply is often limited and the wheat crop receives a restricted number of irrigations. However, most studies show that even one irrigation at planting will increase yields by 0.5-1.0 t/ha. Overall it is estimated that half of the irrigated wheat area in Madhya Pradesh receives less than 50% of the recommended number of irrigations. (More precise data on irrigated wheat are available for Uttar Pradesh; they indicate that only 30% of the irrigated wheat area receives three or more irrigations; see Sinha, Aggarwal, and Chopra 1985 and Figure 21). Hence an important priority for research is to develop appropriate recommendations for the large area of wheat grown under limited irrigation. expansion of irrigated wheat area in central and southern India is likely to slow in the future. area to develop close cooperation. For all wheat growing areas of India, real prices received by farmers for wheat have shown a steady downward tendency except for a short period during the world food crisis of 1973-75 (Figure 22). In general, farmers in rainfed areas receive a somewhat higher price than farmers in irrigated areas and this difference has widened over time. Before the Green Revolution in the mid-1960s, there was no difference in prices received by farmers in rainfed and irrigated areas, but by the 1980s this difference was consistently 20% or more. The data from Sagar District, where fine-grained wheats (C306) are produced, suggest that the price premium received by farmers was first noticeable in the late 1960s and was as high as 30% in the 1970s and 1980s (Figures 23 and 24). For durum wheat grown in South India the price premium is even higher. Even before the Green Revolution, there was a considerable price premium for durum wheats (Figure 24). By the 1980s this difference had increased to about 50%. Figure 22. Real farm gate wheat prices in districts grouped by irrigation status. Source: District data files. Wheat prices deflated by the Wholesale Price Index. real wheat prices decline as a result of the Green Revolution, this decline has been less than it would have been in the absence of their comparative advantage in producing premium quality wheats. Figure 23. Ratio of farm harvest prices for wheat in Madhya Pradesh and Karnataka to prices in Punjab, India. Figure 24. Ratio of wholesale prices of bread wheat in Sagar and durum wheat in central and southern India to price of bread wheat in Ludhiana, Punjab. Table 14. Over 3 million tons of wheat are imported annually from northern India, accounting for one-third of all wheat consumed. Almost no wheat is locally procured and only a small proportion of local wheat production (10% in Madhya Pradesh and Karnataka and 20% in Maharashtra) enters the market. As expected, wheat self-sufficiency declines from north to south. Madhya Pradesh almost achieves self-sufficiency in wheat whereas southern states have a very low level of self-sufficiency. Per capita wheat consumption is also higher among the predominantly wheat consuming population in the northern part of this region (Table 15), but it is still well below consumption levels in northern states such as the Punjab. Note also that wheat consumption is generally much higher in urban areas, where the public food distribution system concentrates its efforts. For example, in Maharashtra and Karnataka, urban per capita consumption is almost three times higher than in rural areas. In the southern states, annual wheat consumption is below 10 kg per capita, lower than most tropical countries (Byerlee 1985). surplus to deficit states is negligible. deficit states of central and southern India is unimportant. marked in the southern states, where wheat consumption is concentrated in the highest income groups. In general, there is a strong trend to substitute wheat and rice for the traditional food staples, especially sorghum (Figure 26). These data suggest that wheat consumption in the southern states could expand rapidly in the future as incomes rise and as the population becomes more urbanized. When assessing research priorities, it is important to know if there is an association between dryland wheat production and the incidence of poverty. In general India's unirrigated areas tend to be poorer than its irrigated areas, and this gap has widened over time. States having a low percentage of irrigated cropped area, such as Madhya Pradesh, also tend to have a low rural per capita income and a high percentage of the population living in poverty (Figure 27). density of poor peope occurs in northeastern India; many are concentrated in districts where rainfed wheat is grown although under more favorable conditions compared to central and southern India. Per capita income (Rs/mo) Figure 26. Share of different cereals in total cereal consumption, rural Maharashtra, India 1977-78. Source: National Sample Survey. Figure 27. Relationship between state agricultural income, level of poverty, and earnings of rural labor households. Figure 28. Real agricultural wages in districts grouped by the percentage of wheat area irrigated. Percentage of total wheat area that is rainfed Percentage of total wheat area that is rainfed Figure 29. Real wages and their trends in districts grouped by the percentage of wheat area that is rainfed, India. Given the low and lagging productivity of dryland wheat, an important question for India and for developing countries in general and CIMMYT is whether more research resources should be allocated to try to increase productivity in this sector. While this paper does not attempt to answer this question specifically for the case of India, it does apply a simple method, called congruency analysis, to illustrate the kinds of analysis that could be undertaken to address this question. A number of methods of varying complexity have been applied by economists to analyze the optimum allocation of resources between research programs, whether they are organized by commodities, regions, or problems. The simplest approach, congruency analysis, examines the allocation of research resources in relation to the share in value of production. In other words, if commodities/ regions A and B account for 70% and 30% of the value of production, respectively, then research resources should be allocated to A and B in a 70:30 ratio (Barker 1988, Scobie 1984). The distinction between zones 4 and 5 is important, since farmers in the more favorable rainfed areas in northern India can often use varieties developed for nearby irrigated areas, while in central and southern India quite distinct breeding programs are needed for dryland wheat. central and peninsular India have been aggregated and the Northern Hills have been ignored. districts of Uttar Pradesh and Rajasthan that border Madhya Pradesh. 1986, it provided only 7% of the wheat produced. Moreover, given the projected trends in growth of irrigated compared to rainfed area, by 2000 this zone may provide only 5% of India's wheat production. However, since ramnfed wheat receives a price premium (the section on "Prices," above), the share of dryland wheat in value of production is presently slightly higher. Some idea of the historical allocation of wheat breeding resources can be obtained by examining the number of varieties released for each of the zones listed above (Table 16). In general, there is a good correspondence between the share of varieties released and the share of value of production. The main exception is the high share of varieties released for irrigated central and southern India relative to the Northwestern Plains (Table 16). For rainfed areas, the share of varieties released is somewhat higher than their share in the value of production, except for the last 10-year period, when only two rainfed varieties were released in Central and Southern India. a Based on current area and production. b Based on projected production and prices. c Weighted by reciprocal of agricultural per capita income. d Excludes northern and southern hills. Modification of Congruency Analysis The analysis described above fails to take into account two other important factors in allocating research resources: the need to direct resources toward alleviating poverty, and the expected rate of research progress. Those living in rainfed areas have already been shown to be generally poorer than those in irrigated areas. Real wages in rainfed districts are less than half the wages in irrigated districts. Income differences may be even greater, since laborers in irrigated areas work more days per year. In general, states with a significant area of dryland wheat, such as Madhya Pradesh, have a high proportion of the rural population living in poverty (Figure 27), although other largely irrigated states, such as Bihar, also have a high level of poverty. Whichever income measure is used, the Northwest Irrigated Plains is clearly the wealthiest zone. 0.5% annually for a significant period. The evidence examined in this paper also suggests that progress has been slow in developing varieties of wheat for dryland India. Indeed, central and southern India are among the most difficult wheat growing environments in the world. The evidence would thus suggest that research progress in dryland wheat is likely to be slow. To include the effects of the level of poverty and rate of research progress into the analysis, two indices can be constructed. One index is based on the value of production weighted by the reciprocal of rural incomes or wages, and the second index is based on both the poverty level and the expected rate of research progress. The weighted index based on poverty level clearly favors increased investment in dryland wheat, because it assigns a higher weight to poor people (Table 16). It also significantly increases the allocation to the Northeast Plains a poor zone as well and decreases the allocation to the Northwest Plains. However, if research progress is expected to be slower in the dryland areas, the weighted index (bottom line) suggests less difference from the share based on value of production, although once again the Northeast Irrigated Plains maintains its importance (Table 16). much more rapid than in the past in India (or in other countries). If the latter is the case, an increased allocation to the Northeast Plains appears also to be a high priority. management research may provide high payoffs in dryland areas. Pradesh) depend more on these crops for income generation or consumption. that wheat will continue to be important. reduce the price premium that farmers in dryland areas now receive. areas, which lowered food grain prices (Renkow 1991). This review of dryland wheat production in India has been motivated by the need for a better indication of the rate of technical progress in dryland areas as well as the need to assess the prospects for future research payoffs in these areas. The paper has distinguished between the rainfed wheat areas of northern India and the dryland areas of central and southern India. In the northern areas, moisture and temperature conditions are generally more favorable for wheat production; the technologies developed for nearby irrigated areas are often applicable. In contrast, wheat in central and southern India is produced under marginal moisture conditions requiring technologies quite different from those used to produce wheat in adjacent irrigated areas. Although rainfed wheat has traditionally been important in national wheat production in India, the extraordinary success in expanding irrigation facilities has resulted in a continuing decline in the area sown to rainfed wheat. In addition, yields of rainfed wheat have grown at only half the rate of yields of irrigated wheat over the past 25 years, further reducing the share of dryland wheat in national wheat production to an estimated 12% today. Most dryland wheat is produced in deep vertisols in a fallow-wheat system depending heavily on the conservation of monsoon rainfall. While this practice represents a relatively inefficient use of total available moisture, for farmers it substantially reduces the risks inherent in kharif cultivation (the difficulty of working heavy soils in the monsoon season, waterlogging problems, etc.). At the same time wheat provides the main source of subsistence food and fodder (wheat straw). Hence, surprisingly for a marginal rainfall area, wheat is regarded by farmers as a secure crop. An examination of historical yields and a crop simulation confirm the relatively low risk in wheat production under these conditions. Moreover, in the driest areas, such as Gujarat, farmers adjust the area sown to wheat according to the amount of moisture available at planting time. This strategy may lead to variability in incomes, but it helps farmers avoid risk. Finally, wheat grown under these conditions is a low-input crop that requires a yield of only 200-300 kg/ha to cover variable costs of production. Even in the driest years, farmers are likely to cover their costs. Although yields in dryland areas have expanded more slowly than yields in irrigated areas, slow but steady progress has been achieved. Perhaps half of the dryland wheat area is now planted to improved varieties. These varieties, many of them durum wheats, are distinguished by their superior drought tolerance, resistance to rusts, and high quality grain (which fetches a price premium in the market). Semidwarf wheats, which spearheaded the Green Revolution elsewhere in India, have made virtually no impact on dryland wheat production in central and southern India. be unfertilized. Experience with fertilizer use has been most positive in the main dryland wheat belt in northern Madhya Pradesh. In the driest area (e.g., Gujarat), no economic response is obtained from fertilizer use. Clearly a priority in increasing the productivity of dryland wheat is to find ways to conserve more moisture. Farmers have developed systems to trap monsoon rainfall for the subsequent wheat crop. Considerable research has also been undertaken to find ways to produce kharif crops. However, in general there is insufficient moisture to allow double cropping, and given the substantial investment in water control/ drainage required for monsoon cropping, and the importance of wheat for food and fodder, these technologies have not been widely adopted. Farmers' major strategy for increasing productivity has been to invest in irrigation, especially tubewells, with the result that the production of wheat under irrigation has expanded rapidly throughout the dryland wheat belt. However, irrigation is only possible where there is sufficient groundwater at a reasonable depth; it seems that much of the area that is currently irrigated is unsustainable because of limited groundwater supplies. Given that dryland areas of India have generally lagged behind irrigated areas in the rate of technical progress, there is pressure to increase productivity in dryland systems. An important question is the tradeoff in allocating wheat research resources between favored (i.e., irrigated) areas and dryland areas. While it is not the place of this paper to recommend the level of priority that should be assigned to dryland wheat research in India, a simple analysis urges some caution in increasing investment in the marginal areas relative to favored areas. Some evidence suggests that breeding resources have been allocated to dryland wheat in accordance with its relative importance in total production. In the future, the declining importance of dryland wheat may suggest a declining priority to wheat research in this environment. There are, however, a number of qualifications to this tentative conclusion. First, we have assumed that research progress will be slower in dryland areas. In the case of crop and soil management research, this may not be the case. Second, the close association in India between the incidence of poverty and dependence on dryland agriculture may justify further research to increase agricultural productivity in these areas. Finally, some consideration should be given to the interactions between favored and marginal areas occurring through food and labor markets. Given that many households in marginal areas are net food purchasers, any decline in food prices (e.g., through increased productivity in irrigated areas) may benefit the poor in marginal areas (Renkow 1991). On the other hand, given the specialization of marginal areas in premium wheats, success in efforts to produce premium wheats in irrigated areas (e.g., through high quality durum wheats) may have adverse effects on prices received by wheat producers in marginal areas. The resolution of these questions requires more in-depth analysis than is afforded by this paper. Source: Fertilizer Statistics of India (various issues). a Calculated by multiplying rabi fertilizer offtake by the estimated share applied to wheat in each state. The estimated share to wheat was computed from Desai (1982) and Cost of Cultivation Surveys. Paper 91/02. Mexico, D.F. CIMMYT. CIMMYT. 1989a. Toward the 21st Century: CIMMYT's Strategy. Mexico, D.F. : CIMMYT. Revisited: Recent Trends and Future Challenges. Mexico, D.F. : CIMMYT. Fischer, R.A., and Varughese, G. 1990. Developments in CIMMYT Wheat Program in 1989. Report 77. Patancheru, India: International Crops Research Institute for the SemiArid Tropics. Delhi: Directorate of Economics and Statistics, Ministry of Agriculture. Economics and Statistics, Ministry of Agriculture. Paper, Dharward, India: University of Agricultural Sciences. paper. Mexico, D.F. : ICAR/CIMMYT (forthcoming). India: International Crops Research Institute for the Semi-Arid Tropics. Pp. 282-292.
other cereals with reference to Maharashtra. In Wheat in the Changing Social Context. New Delhi: Government of India. accomplishments. Arnej Station, Gujarat Agricultural University, India. Mimeo. Tropical India. Ph.D. thesis. St. Paul: University of Minnesota. Rao, M.V. 1976. Wheat production prospects in India. In Wheat in the Changing Social Context. Paper No.4. Mexico, D.F. : CIMMYT. a Seminar on Management of Deep Black Soils, New Delhi. Economics Working Paper. Mexico, D.F. CIMMYT. an operational research project. Fertilizer News 29(4): 59-71. Institute for the Semi-Arid Tropics. Workshop. Patancheru, India: International Crops Research Institute for the SemiArid Tropics. Walker, T.S., and J.G. Ryan. 1990. Village and Household Economics in India's Semi-Arid Tropics. Williams, J.R., P.T. Dyke, W.W. Fuchs, V.W. Benson, O.W. Rice, and E.D. Taylor. 1990. EPICErosion/Productivity Impact Calculator: 2. User Manual. USDA Technical Bulletin No. 1768. Washington, D.C.: United States Department of Agriculture. 90/01 The Design and Management of Call System Training in On-Farm Research (R.
90/02 Economic Losses from Karnal Bunt of Wheat in Mexico (J.P. Brennan and E.J. 90/03 Public and Private Investments in Maize Research in Mexico and Guatemala (R.G. 90/05 The Maize Subsector in Paraguay: A Diagnostic Overview (M.L. Morris with M.
91/01 Land Prices, Land Rents, and Technological Change: Evidence from Pakistan (M.
of Maize Technology in Malawi, 1989-91 (M. Smale, with Z.H.W. Kaunda, H.L. Makina, M.M.M.K. Mkandawire, M.N.S. Msowoya, D.J.E.K. Mwale, and P.W.